The forecast track will still take Fay offshore barely Saturday then back in near Pensacola or Destin Sunday for its (hopefully) final landfall. Fay moves west-northwest and loops in western Alabama and eastern Mississippi Sunday - Tuesday. 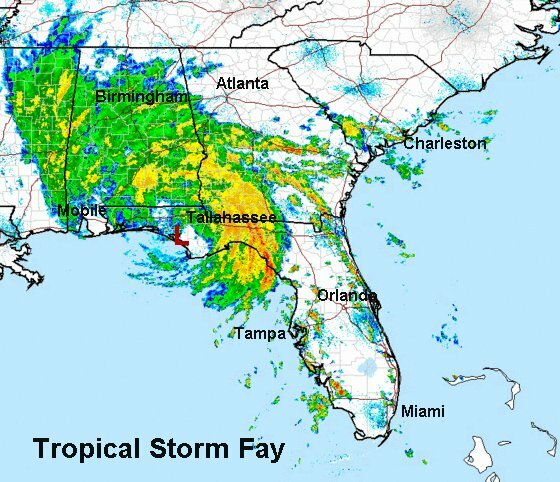 After that it looks like Fay moves across north Georgia. The heaviest rains will shift from northwest Florida into Alabama and Mississippi by Sunday and Monday. Use extreme caution will driving, roadways may be flooded. A tornado threat continues into tomorrow for parts of South Carolina westward into southern Alabama. Southwestern Georgia and the Big Bend of Florida are now in the conveyer of heavy rain moving northward from Apalachee Bay. The latest Doppler estimates now indicate totals of 10" in western Taylor county, southeast of Tallahassee. The heaviest rain now covers Taylor, Jefferson and Leon counties of Florida and Decatur, Grady, and Thomas counties of Georgia. The heaviest rains will continue over the Florida panhandle today, and gradually move into Alabama today and linger over Alabama, Mississippi, Louisiana Sunday and Monday. The rain will start to move into north Georgia and the western Carolinas Monday, Tuesday and Wednesday. The exact center of circulation is just east of Panama City and will move offshore shortly. A larger circulation is developing just like off of Daytona a few days ago and over Apalachee Bay last night. This will allow Fay to retain its strength, even possibly strengthen a touch. The main concern will still be flooding rains. <b>How many landfalls?</b> So far: 1. Key West 2. Cape Romono 3. Flagler Beach and 4. southwest of Carabelle. Those are the "official" NHC landfall points. As we pointed out, last night around 1:30 am, Fay crossed Dog Island. If there's an official landfall at Carabelle, then Dog Island must have had a landfall too. So, 5 landfalls so far? The forecast calls for landfall #5 (#6) earlier now. 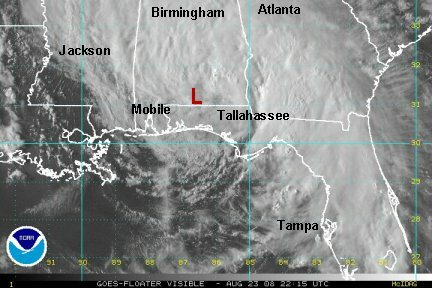 It appears that Destin or Pensacola Beach will be the next landfall tonight. As pointed out earlier, Fay will continue west toward Mississippi and stall. By Monday or Tuesday Fay will start moving northeast and finally be in the Appalachian mountains by Wednesday. The rain will be around for awhile in the Southeast. 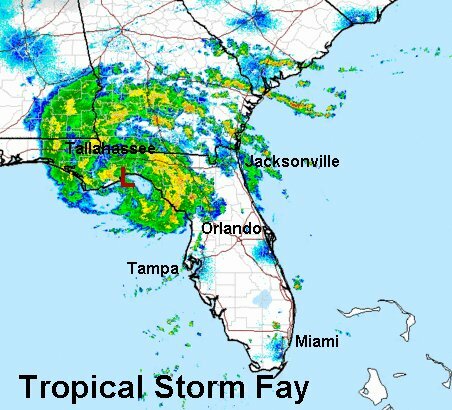 At this time Fay appears to have slowed to a crawl and is centered over Panama City, FL. Rainfall rates up to 3" per hour were noted east of Tallahassee toward Perry a short while ago. The latest Doppler estimates are in the range of 10-15". The worst of the rain has been seen in Taylor, Madison, Jefferson, and southeastern Leon counties of Florida. Doppler has estimated 8" or more in the south Georgia counties bordering Florida with Grady and Thomas in the 10-15" range. The storm prediction center still has a tornado watch posted north of Tampa into the Big Bend. Isolated tornadoes may not confined to that zone though. Our new concern.. 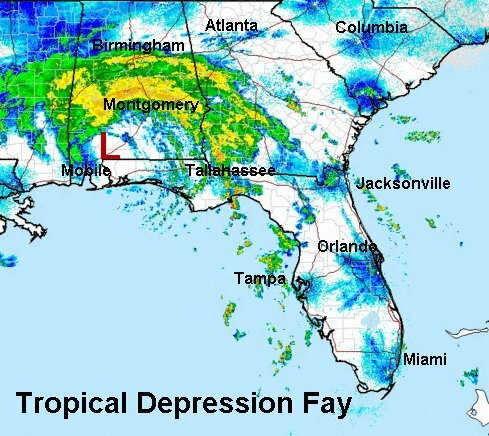 The latest forecasts suggest that Fay will stall in southern Mississippi Sunday, Monday and now maybe Tuesday. It may not start to move northeast now until Wednesday. A growing trend shows the fetch of rain from the Gulf continuing into the Big Bend of Florida, while points farther west in the panhandle get much less rain. Rain should continue off of Apalachee Bay into tonight and redevelop some tomorrow. 20"+ is not out of the question in the hardest hit areas. I contacted the National Hurricane Center, and they will be getting back to me about my question concerning landfall at Dog Island first before southwest of Carrabelle. It may not be resolved until a post Fay report though. I have some colleagues at NHC that have been very helpful! 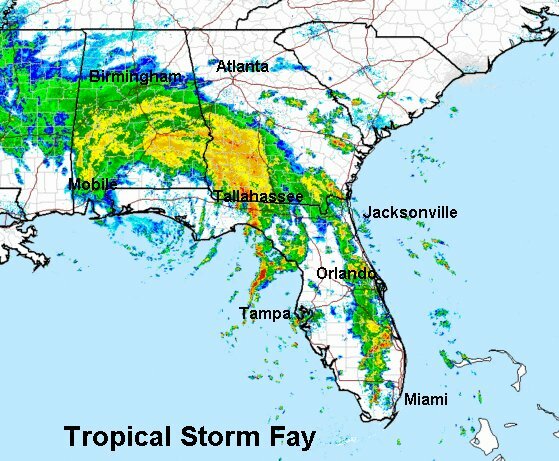 Fay made it over Panama City, FL a few hours ago, but has now turned northwest. It is east of DeFuniak Springs, FL heading into southern Alabama. In the meantime, the Big Bend of Florida continues to get soaked with heavy rain. A large band of heavy rain continues northward from Apalachee Bay. The next complete update will be this evening. Heavy rain continues to move north in a thin band across Jefferson county, FL. These cells look tornadic. Other tornadic cells are in southwestern Georgia and southeastern Alabama. Make sure that you have your weather alert radio on the alert mode! 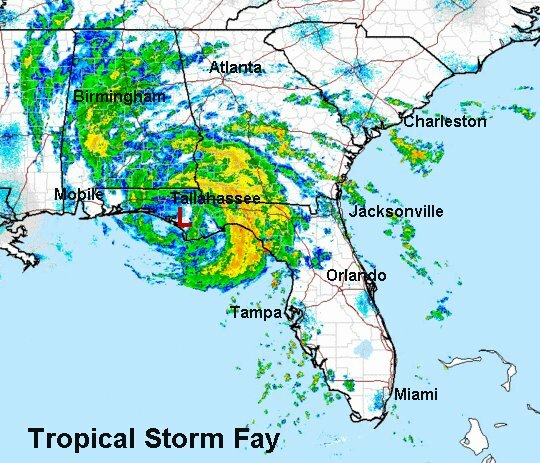 Fay is centered about 15 miles south of Andalusia, Alabama near the Florida border. It apperars to have stalled some. Forecasts take Fay west northwest and loop it in southern Mississippi or northeast Louisiana until around Monday night or Tuesday. At that point Fay should start to slowly move into the Tennessee Valley bringing rain to north Georgia and the western Carolinas....who desperately need a lot of rain. Stay updated and stay safe. Roads could be flooded. It only takes two feet of moving water to move a car! Even though Fay is now a depression, its saga isn't nearly over. 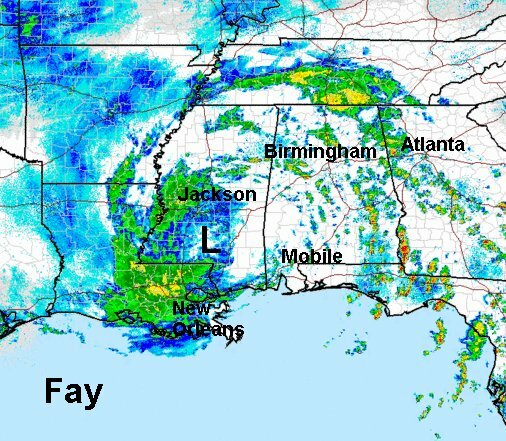 Fay is now centered about 50 miles northeast of Mobile, AL and heading west-northwest for southern Mississippi where it will spend the next few days. Heavy rain has now shifted north in a large band from Birmingham to Montgomery, AL. Isolated heavy showers and tornadoes are still possible tonight in the Florida Big Bend and into southwest Georgia and southeast Alabama. The St. Marks river will be at record stage Sunday at Newport, with the water level 5 feet over flood stage. The National Weather Service confirmed what we suspected in an earlier update. They estimated rainfall totals up to 25" with a storm report (which we think is just east of Tallahassee) of 22". The 25" estimate was made a few hours ago and locally scattered heavy showers have continued since then with rainfall rates up to 1-2 inches per hour. Rainfall Doppler estimates are now in the 2 1/2 -4" range in central Alabama and in the 10-20" zone for most of southwest Georgia with isolated amounts near 25". The new models have Fay going a little farther south. They take it into southern Mississippi Sunday then southward into Louisiana west of New Orleans. It loops and stalls in Mississippi until Tuesday morning! It then makes its slow course northeastward. So, showers will become scattered out over the next few days, but still with locally heavy rain! Please let us know if there is anything that we can do here to serve you better! If you have time please answer the poll that we've posted! Thanks! 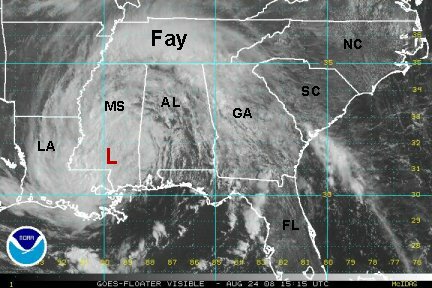 Fay is now centered over southern Mississippi. The forecast models stall it and slowly weaken it over the next several days in Mississippi and Alabama. Scattered showers and storms will remain in the Southeast with the remnants of Fay through Wednesday. The tornado threat remains elevated today, especially in northwest Florida, southwest Georgia and southern Alabama. This will be our last update on Fay.....our attention now turns to the Caribbean!